Well, finally decided to upgrade my backup 1200xl to U1MB. Ordered from Lotharek (less than 2 weeks and it was here, he's definatley improved). Took my time installing (about 2 hours, checked and re-checked every wire and solder joint). However when it came time to turn it on... what I get is in the attached screenshot. No keypresses seem to have any affect (except Reset, which just brings back the same screen). Power cycling just brings the same. Did I screw up the install? Did I get a bad U1MB? Any quick fixes to get this thing going? I'm heart-sick that I may have destroyed my other 1200xl. This is exactly what I got the first time I installed one and connected RST or similar to the wrong point on the motherboard. Quadruple check time, I'm afraid. I had the same issues with my main 1200XL, but that particular problem was random. The first time I booted it up it was great. However, resetting it would sometimes either just not work or occasionally reset the Real-Time Clock and/or give me corrupted graphics like that (or with a yellow/garbled character set). The same U1MB installed in an 800XL works great. I think that 1200XL of mine has something not-quite-right but I haven't pinned down the problem yet. Static parts of the display (not corrupted) are in ROM, garbage in RAM, so check address lines and four wire harness. Given Dragon375's problems installing in his 1200XL, my problems a couple weeks ago, and the problems others have had (do a search), I'm not entirely certain the accepted wisdom for instilling in a 1200XL instructions is quite correct with regard to which jumpers to remove and/or replace. Those jumpers configure how the board handles the OS sockets. If they're not right, nothing will work right. I had the same problems no matter whether I soldered straight to the shoulders of the CPU or using solder pads on the board. I don't know what the received wisdom is, but I know it works the way I described it. This is precisely why I have not attempted this yet, and I have ten 1200xl's I was going to do. Until there is a 100% proven way of doing this, I won't try. One person says one thing, another says something else. We need to have this documented. Flash, could you PM me the instructions? I will compare them to mine. I've done three machines the same way without a hint of bother. Odd. I'll inspect my machine again and reiterate details later. Right: of W6, W7, W8, W9, W11, W12 and W13, only W11 is jumpered. I happened to pick off the signals for the four wire harness from vias near the MMU, but I don't see why direct connections to the CPU should cause problems and the vias are easy to source with a multimeter anyway (which is how I figured them out, and I have no prior electronics knowledge at all). Not sure what else to add, except ensure that all the connectors are attached the right way around. If you want to eliminate problems with ultimate itself, perhaps try a stock OS ROM in the back socket and and XL/XE MMU in the MMU socket. Well, my immediate suggestion would be "replace the sockets on the board with precision counterparts". Indeed this should probably be step 3.5 in the "wisdom" list. It certainly is in mine. Edited by flashjazzcat, Sat Aug 15, 2015 3:12 PM. Yes, I understand lots of people like to do this. I, on the other hand, have swapped chips around 8-bit computers and videogame consoles for years without ever destroying a pin or damaging a factory socket, so I don't think that really is the issue. That said, it would be nice if Lotharek's site had explicit instructions for each type of machine along with photos of recommended mounting points, etc. I'm not entirely convinced that my personal machine's problems are related to the U1MB at all. I need to return the motherboard jumpers to the original configuration before I can even test it properly to see if something else is amiss. But in the meantime, the U1MB purrs along fine in an 800XL. Well, you may be convinced that the socket isn't the issue, and it may not be the issue, but it may be the issue and it's perhaps an issue I've avoided by routinely replacing the thirty year old sockets with precision versions. You may never know until you try. As for installation instructions: I'm assuming Lotharek has a 1200XL by now (he did not previously, and for a long time), but as you say: the issues may be entirely unrelated to the Ultimate board so there's little point in conjecturing further until you've reverted the machine to stock and/or replaced the sockets. Regarding mounting points: you're better off going with "received wisdom" there, since the vendor tends to advocate a single self-tapper driven through the casing to secure the board. I've provided here (which I don't necessarily mind doing) both installation instructions and recommended mounting strategies, so if it doesn't work and/or looks like crap, and yet the board works, then the problem probably lies with the machine itself or some other component between the chair and the desk, as they say. Well, I did as suggested (thanks Jon) and rechecked the 4 wires I actually had to solder during the installation and found a bridge. Cleaned that up and it straightened up the screen corruption issue. I can change the U1MB options and boot the computer. However, I now have another strange thing happening... 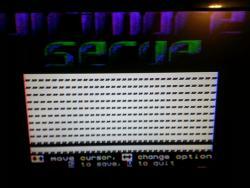 If I just turn the Atari on (no keys pressed) it boots into the XEGS game in XEGS slot 1. If I hold option, it will boot SDX from the U1MB. I have Basic C flashed into Basic Slot 1, but it wont boot from there no matter what options I select in the Ult config menu. 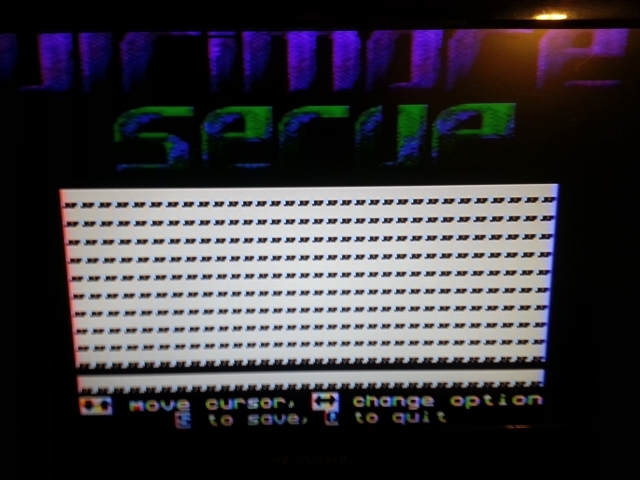 I did not change any jumpers etc on the U1MB board itself, so I dont know why I'm getting XEGS mode. But at least it is working now (if still not working right). Progress is progress. OK, time to put this issue to bed. I reflashed the U1MB bios and PBI to the newest and all problems disappeared. My computer boots and runs just the way it is supposed to now. Going to have to deal with that mounting issue sometime.. but for now just enjoying all the A8 goodness the U1MB brings Thanks for any and all that tried to help during this thread (especially FJC). It was my damn shaky soldering hands, and needing to update the firmware.. it is all now and truly sorted. The U1MB is by far the best upgrade to my A8 that it has been my pleasure to own.. and best of all I DIDNT KILL MY 1200XL!!! BTW - Included with my U1MB Lotharek supplied a screw, a nylon standoff and 2 nuts for mounting.. I guess he does read this forum. Edited by Dragon375, Sun Aug 16, 2015 12:10 AM. Well, I did as suggested (thanks Jon) and rechecked the 4 wires I actually had to solder during the installation and found a bridge. Cleaned that up and it straightened up the screen corruption issue. Just out of curiosity (and in hopes of eventually moving my U1MB into my main 1200XL, what is the configuration of your jumpers (W6, W7, W8, W9, W10, W11, W12, W13)? And where are your solder points for the CPU connections - the chip shoulder or points on the 1200XL PCB? OK, time to put this issue to bed. I reflashed the U1MB bios and PBI to the newest and all problems disappeared. My computer boots and runs just the way it is supposed to now. Fantastic news! Congratulations - a success story gives me hope. So we can agree that this is the correct jumper configuration then, since four machines are now known working using identical methods? Hope so. That's the way I had things in my U1MB initially but kept having those reset/screen corruption issues. Personally I'm going to revert my main 1200XL to stock and see if I have any problems. If so, I'll solve those, then try the U1MB again. I have another working 1200XL I could try but it's got a few major cosmetic issues, and I'm not inclined to change the board configuration from stock if I can reasonably avoid it. Why not place an XL OS and MMU in the machine using the current jumper configuration and see if that works first? I have - it doesn't. I just get a red screen at boot now. If you read up on the "make your 1200XL into an 800XL!" posts over the years there have been different posts describing different board jumper configurations, jumper wires soldered between a pin on the XL MMU and the PIA, etc. Not sure which info is "correct" and not included to do anything else at this point but revert to stock and see what happens. Just tried an XL OS ROM and MMU on my Ultimate 1200XL and it didn't work here either, so that's not the useful test I assumed it to be. Perhaps there is a jumper configuration which allows for this. I remember seeing a 1200XL Candle was working on which had one or more jumpers traversing pins diagonally. It would be interesting to try and work out what this does.